Corgis in your house, corgis in your memes, corgis in your digital cryptocurrency. Where else can corgis go? To your co-op games. Corgi Warlock from Xander's Corgi Arcade is a sidescrolling action game that lets you and up to three friends go on an adventure that may or may not involve shooting fireballs at a giant spider. Because that's what corgis do! 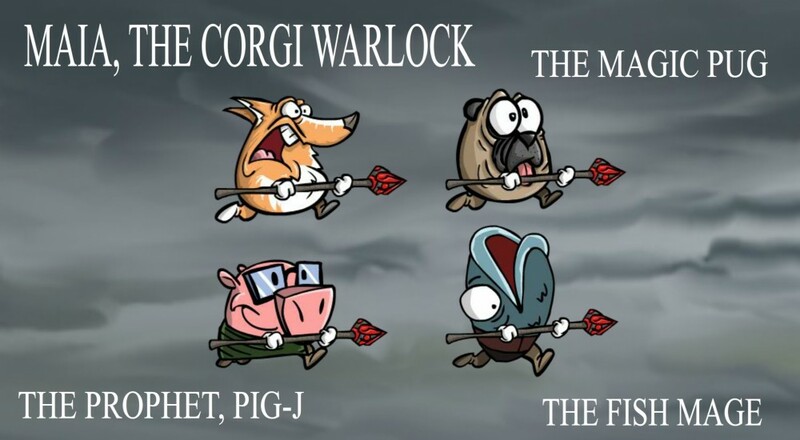 Corgi Warlock is a simple sort of action game that takes place in a two dimensional world. Warlocks on the left, enemies on the right, and tons of fireballs and other warlockey things in the middle. Players control a corgi, a magic pug, a pig prophet, and a fish mage, all of whom can use magic like nobody's business. Each stage is filled with all sorts of creative enemies, but the best part by far are the huge bosses you and your team will defeat. Screen-sized rock monsters, vampires, dragons, and more. Corgi Warlock never fails to surprise you with its variety of bad guys. Corgi Warlock is currently available on Steam and supports 1-4 local players. Its ease of gameplay and simple difficulty makes it an ideal game to play with the kids or to unwind with at the end of the day.